Are you or a loved one thinking about participating in a clinical trial and want to learn more about research at AdventHealth, formerly Florida Hospital? Are you looking for an experienced research facility? Do you want to learn more about our Institute’s capabilities, and how we might work together? 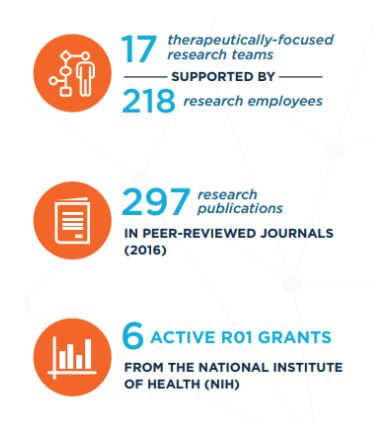 We conduct hundreds of clinical trials each year designed to improve healthcare and find cures for a wide range of diseases. Clinical trials give our patients access to brand new treatments that are not widely available. Participation is also a great way to honor a loved one who has battled a disease by helping scientists better understand how to treat it. To find out what clinical trials are currently available at AdventHealth Orlando and how to qualify, call (407) 303-7771 or email FH.OSP@FLHosp.org. AdventHealth Research Institute Orlando has over 500 research studies at any given time being conducted by 15 Research Areas. We partner with physicians, pharmaceutical companies, and medical device and technology manufacturers around the world with the goal of radically advancing healthcare. Our world-class team of researchers, clinical scientists and support staff is equipped to meet a wide array of research needs. We offer specialized, medical facilities and equipment. Plus, we treat more than one-million patients each year from the highly diverse, Central Florida region. This unique, participant population enables highly customized studies to be performed, and expedites discovery and speed-to-market capability. World-class researchers - Leading clinical scientists in disciplines from oncology to diabetes to cardiovascular disease oversee groundbreaking clinical studies in 15 research units. High volumes enhancing rapid enrollment - Since AdventHealth cares for more than 1,000,000 patients annually, it is a high volume facility which gives greater access to potential participants for clinical studies than most other competitive facilities. Specialized facilities and equipment - From room-size calorimeters for extended metabolic studies at the Translational Research Institute for Metabolism and Diabetes to the Global Robotics Institute at the AdventHealth Celebration campus, AdventHealth Orlando has unique and specialized capabilities to meet a wide array of research needs. Diverse participant population - Central Florida has a diverse population from which AdventHealth Orlando draws research participants, with approximately 52% White, 27% Hispanic, 15% Black, 4% Asian and 2% Other, enabling customized studies for its research collaborators.